It is always such a pleasure to be commissioned for pregnancy photography and I am lucky enough to have become highly sought-after for my outdoor maternity photo shoots. I have recently been featured in Practical Photography magazine UK for my pregnancy portraits. I specialise in creating beautiful, light-filled maternity photos in natural, outdoor environments throughout West and South West London (although frequently clients travel to London from elsewhere in the UK for a session with me). I also cover parts of North London; Hampstead Heath is one of my favourite locations for pregnancy portraits. My aim is to create beautiful, natural portraits of you during this fleeting, special time. You can see my full portfolio of pregnancy portraits here. My style is very soft and feminine, making the most of beautiful natural light to create gorgeous, flattering, natural portraits. I will help you as to where and how to stand so that you look your best, in the prettiest light. I also love to include your partner and any older children in the photos too - and dogs have been known to be part of the shoot! ! I know partners can be nervous and reluctant, but the whole session will be easy and relaxed - I often have them hold my reflector for a short while, which helps me out as well as giving them something useful to do! I generally recommend booking your pregnancy photoshoot to take place around the 30-34 week mark, or a little later if you have a smaller bump! Please note that maternity tends to be my most popular type of portrait photography and weekends in particular tend to get booked up at least a month in advance, or longer in the summer months. Obviously it is entirely up to you and your personal style as to what to wear for your maternity photos; the most important thing is that you feel comfortable! However, soft, floaty and feminine clothing in neutral colours or pastels photographs very well and will show off your growing belly beautifully. That sort of clothing also fits very well with my feminine style of maternity photography. For example, this might be a flowing dress or a simple tank top with a long skirt. I love to help my clients plan their outfits for their sessions and will give you as much input as you like! 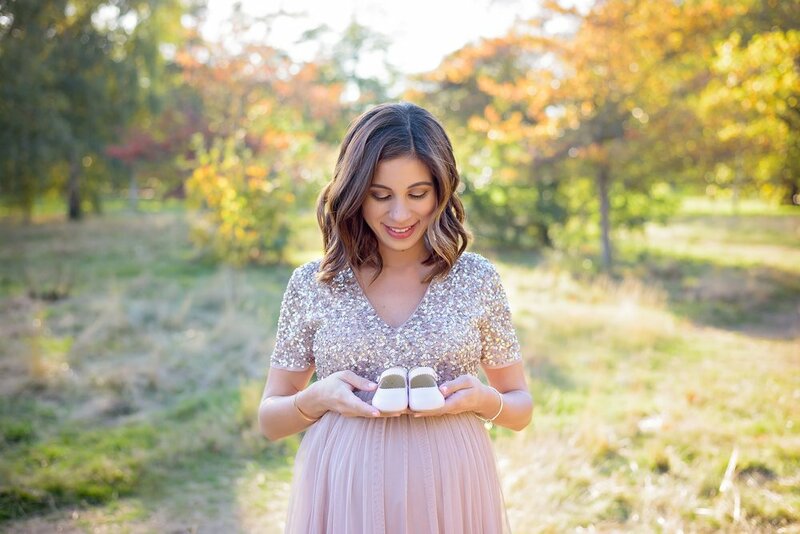 Quite a few clients have found lovely dresses for maternity shoots on ASOS, Fillyboo and Free People. In the summer I am a huge fan of cream boho maxi dresses and in winter berry, plum and autumnal tones of camel and mustard look wonderful. The session fee is £225 for up to an hour of photography and is paid for at the time of booking. The session fee pays for the time photographing you and your partner and any other children. It does not include the edited digital images (the price of which ranges from £350 to £625 depending on the number of images you choose to purchase), or my beautiful fine-art prints or albums which can both be purchased after your session if you wish to do so. I'd love to hear from you so that we can chat more about your London maternity photography session. You can reach me here, or at heather@heatherneilson.com.